I have proposed a Narrative Index for evaluating the “narrative strength” of any given text. It needs a substantial amount of text (at least a few thousand words) to have much reliability. But when you analyze large amounts of material throughout history, clear patterns emerge — especially for great communicators. 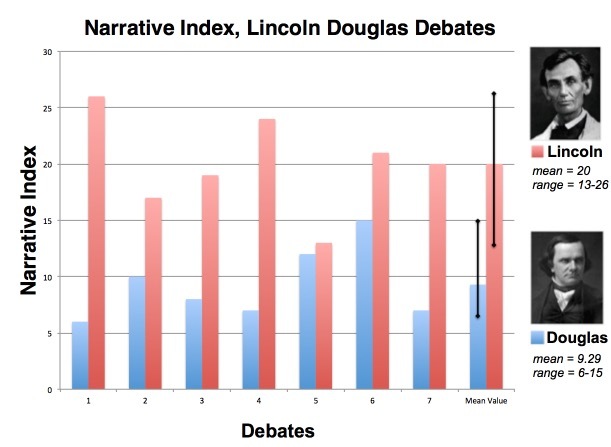 The famous Lincoln-Douglas debates provide the perfect starting point for seeing how much The Narrative Index reveals. In the summer of 1858 Abraham Lincoln — the Republican candidate for Senator from Illinois — squared off in seven debates with the incumbant Stephen Douglas. All of the debates used the format of 60:90:30 — the opening candidate spoke for 60 minutes, the opponent got a 90 minute rebuttal, then the opener was given a half hour to finish. Just speeches, no questions from moderators. The debates drew huge audiences (tens of thousands) with the texts being widely printed in newspapers. There was some fudging of the transcripts by papers favorable to each candidate, but only minor variations. For my analysis I have used the version presented on the website of the National Park Service. The result for each debate is a solid sample size of the candidates’ rhetoric — around 10,000 words for each debater’s individual performance. 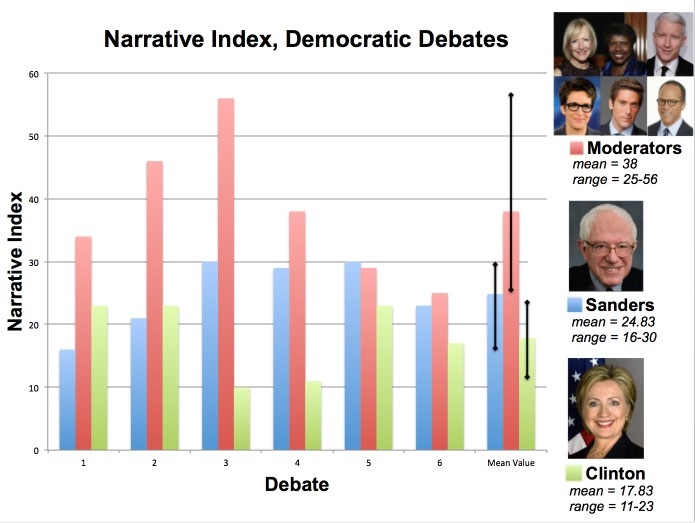 What you see in the figure above for their Narrative Index values is that they barely even overlapped. Douglas’ highest value (15) was only a little more than Lincoln’s lowest (13). Most of the time they weren’t even close. In simple terms, Abe was telling ABT’s while Douglas was “Anding.” Lincoln had much greater narrative strength. When you read the accounts of witnesses you hear color commentary bringing these data to life. Observers told about how confident and arrogant Douglas was at the start, viewing Lincoln as much less experienced and thinking he would be easily out-witted. But by the fourth debate the audiences were rallying for Abe as Douglas began to sweat. You can see when it came to narrative strength, he was dwarfed by Abe for the first four debates. In the fifth debate he stepped things up a bit, but by then it was too late and he was starting to get ill. By the end he was collapsing in defeat. For the first four debates Douglas was below 10 while Abe was spiking up to 25. What does this mean specifically? That says it all. The whole thing about the AAA is that it is the easy, default mode of communication — easy to spew out quickly (i.e. comes out as “a rushing, unbroken stream”) because it doesn’t involve the narrative parts of the brain — it’s just shooting out statements. Activating the narrative regions slows things down. Lincoln was clearly the more thoughtful speaker, constructing his ideas with more narrative structure. Though he lost to Douglas in the 1859 election, he of course beat him for President the next year and went down in history as a great speaker. His two inaugural speeches scored 16 and 21, respectively for the N.I. His “House Divided” speech was a 21, his Cooper Union speech was 20, and of course his most famous speech, the Gettysburg Address, while too short to justify analysis (it has just 6 “ands” with 2 “ buts” for an unusually high N.I. of 33) is just one big ABT of three paragraphs total. Clearly Lincoln had deep narrative intuition. The Narrative Index gives us a means of quantifying this comparatively. Perhaps the second most famous set of debates in American History were the four held in 1960 between Presidential candidates John F. Kennedy and Richard Nixon. 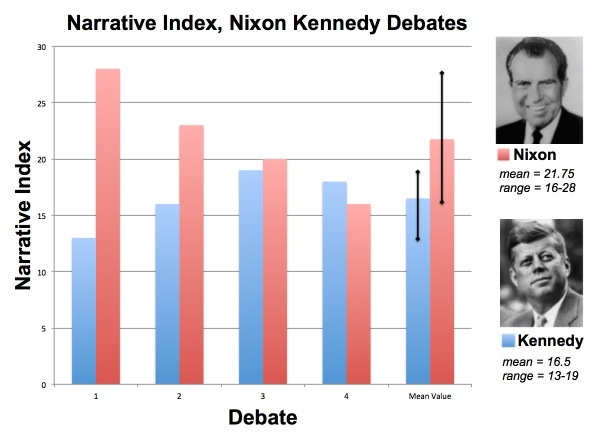 You can see Nixon out-scored Kennedy in terms of the Narrative Index for the first three debates, yet by the third one there was widespread agreement that Kennedy was winning. How could that have been? This is the exception that proves the rule. For the first debate it was widely reported that polls of people listening on the radio had Nixon as the winner. There’s your narrative content at work. When all that people received was the words through their radio, the narrative structure won out. KENNEDY-NIXON. People heard Nixon win, but they saw Kennedy win. But television viewers scored it differently. They scored the handsome, relaxed, young Kennedy — who came to be known as the first “telegenic President” — as much more effective than the nervous, sweaty Nixon with the five o’clock shadow. These were elements of communication left out of radio or the written text. The Kennedy-Nixon debates (as wonderfully presented in David Halberstam’s, “The Powers That Be”) defined the beginning of “The Age of the Television President.” Things were never the same. The divide between radio and television scoring for the first debate shows the relative importance of substance (what they were saying) versus style (how they looked). 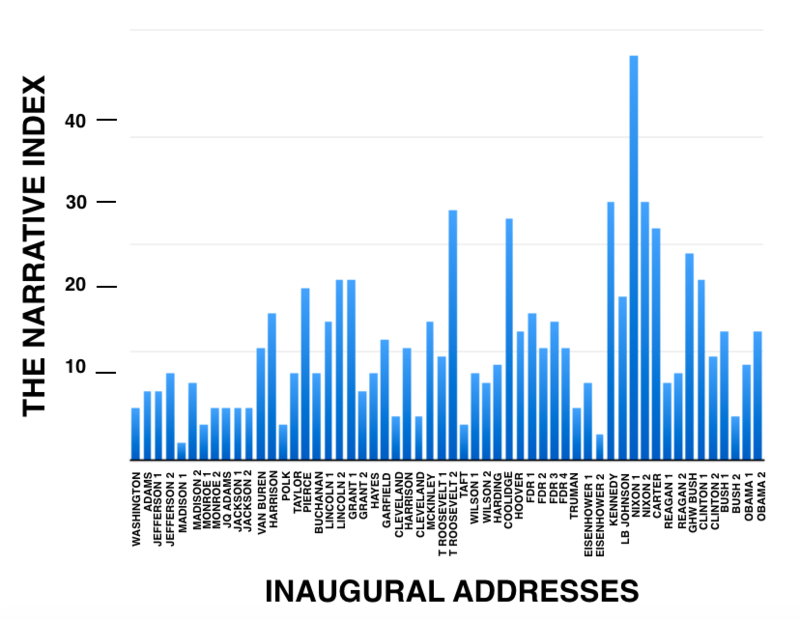 Broader patterns emerge when you look at all the inauguration speeches of the Presidents. There’s substantial variation and at least a few scores that are minor head scratchers. For example, Calvin Coolidge was known as “Silent Cal” — you wouldn’t really expect him to have one of the highest values of all time (he scored a 29). But on the other hand, despite his penchant for few words, he was actually known as a skilled speaker. More importantly, of the six other of his speeches I’ve analyzed, the lowest was still a 14, so he wasn’t devoid of narrative intuition. FIREBRANDS AND DISHRAGS. Nixon bruises while Bush snoozes. Equally somewhat disappointing is Obama. You’d hope he would score highly, but his two inaugurals are 11 and 15 while his State of the Union speeches range from 12 to 19. It seems to be the case he doesn’t draw heavily on narrative structure. Of the 10 speeches I’ve analyzed, they range only from 9 to 18. I wish I could say his Reverend Wright speech was a barn burner — it’s my favorite of his speeches — but it’s only 15. I’m afraid the numbers are very consistent for him — never into the 20’s. Which means you don’t have to have a huge N.I. to be a great speaker, but it’s still a significant characteristic of most effective communicators, and nobody has labeled Obama “The Great Communicator” as they did with Reagan. It’s clear a lot of early Presidents hardly ever said “but.” But … there are interesting spikes with Lincoln, Teddy Roosevelt, and eventually the ultimate monster of ambition, Nixon, who set the bar highest. What’s more interesting and even fun are the dishrags. Some folks just don’t seem to bring any narrative content to what they have to say. Not surprisingly, they are all known as kind of wishy washy. I’m talking about not just those early, polite Presidents, and not just Eisenhower who didn’t score above 10 for either of his inaugurals nor any of his first five State of the Union speeches. The guy I’m talking about is George W. Bush. Not only did Bush score a mere 5 for his second inaugural, it turns out none of his seven State of the Union speeches — not even after 9/11 — managed to score above 10. They were: 4, 2, 3 4, 5, 4, 4. Is that a surprise? Would anyone ever have called him a great speaker? He was the ultimate “And, And, Ander.” It’s kind of the whole spin Will Ferrell put on him — the guy speaking vacuous statements, reaching for something clever, ultimately only able to say, “strategery” — unable to turn a phrase. In contrast, Nixon’s State of the Union speeches for 1970 to 1974 were 27, 16, 23, 18. He always had something urgent and important to say. But did Nixon really have that good of a feel for narrative structure? Yes. Just look at how he opens his record-setting first inaugural (scored a 46). This is the fundamental need for narrative, in order to keep it interesting — it must be advanced. You must constantly be adding sources of contradiction, then driving for consequences. We can see this at work clearly with the moderators of today’s television debates. Television producers live in dread fear of boring their audience. It’s the job of the moderators to prevent this by interrupting the debaters, and more importantly, interjecting conflict by squaring them off against each other. You hear the moderators saying over and over again, “Candidate A, last week you said X, BUT your opponent said Y, how do you reconcile this?” If they are doing their job properly they are constantly driving the narrative dynamics. This ends up showing clearly in the collective N.I. value for the moderators of each debate. Look at the third Democrat Debate — they reached 56, which is unheard of for a speaker. And you can even add to that a fair amount of non-narrative logistics explanations and pleasantries. Clearly their job is to drive the conflict. THE ABT DRIVERS: Clinton and Sanders are kind of a big whatever in narrative terms, but far more interesting is the role of the Moderators. It’s their job to “advance the narrative.” This is reflected in the N.I. SO WHAT IF THERE WAS A PRESIDENT WHO NEVER, EVER SLIPPED BELOW A NARRATIVE INDEX OF 20?